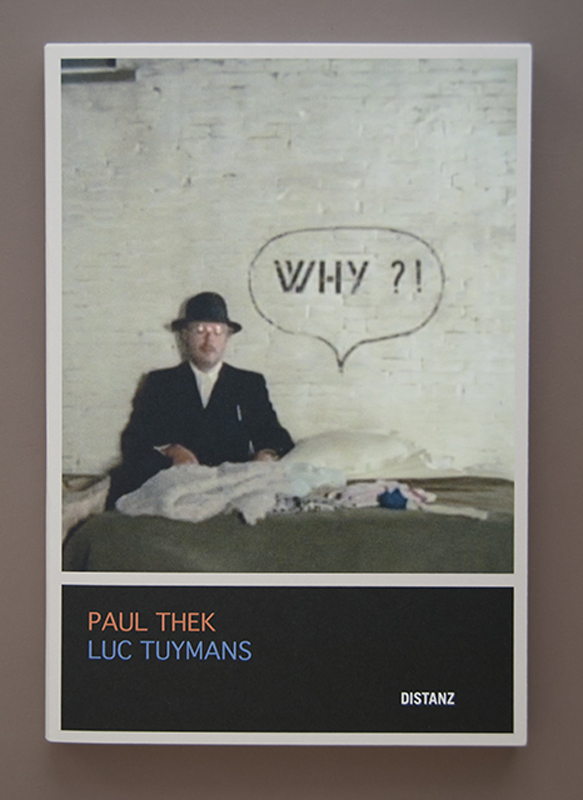 Der Katalog „Paul Thek / Luc Tuymans: Why? !“ ist anlässlich der gleichnamigen Ausstellung im Sommer 2012 in der Galerie Isabella Czarnowska in Berlin erschienen. In der von Luc Tuymans (geb. 1958) kuratierten Ausstellung wurden neue Werke des belgischen Künstlers denen des Bildhauers und Malers Paul Thek (1933-1988) gegenübergestellt. Paul Thek war 25 Jahre alt, als Luc Tuymans im Jahr 1958 geboren wurde; als Tuymans 30 Jahre alt war, starb Thek. Trotz großer Ausstellungen in den wichtigen Museen der Welt verharrt das Werk von Thek in unüberwindlicher Ferne. Es galt als Beispiel für eine „private Mythologie“ (Documenta 7, 1972) und ist selbst zum Mythos geworden; Thek wird als „Artist's Artist“ bezeichnet. Das Werk von Tuymans hingegen steht mitten in der gegenwärtigen Aktualität, doch nur, indem es auf seinem Anachronismus besteht. Es will als „authentische Fälschung“ verstanden werden, gibt sich von vornherein veraltet, den unabschließbaren Momenten der katastrophischen Geschichte und einer Gegenwart zugewendet, die bereits von ihrem künftigen Verfall angehaucht ist. In dem Katalog diskutieren Luc Tuymans, der Sammler Harald Falckenberg und der Kurator und Autor Julian Heynen die in der Ausstellung gezeigte Beziehung zwischen Tuymans und Thek sowie die Rolle von Mike Kelley, der wesentlich zu einer neuen Auseinandersetzung mit Thek beigetragen hat. The catalogue Paul Thek / Luc Tuymans: Why?! was published by Galerie Isabella Czarnowska in conjunction with the exhibition of the same name taking place in Berlin in the summer of 2012. Curated by the Belgian artist Luc Tuymans (b. 1958), the show juxtaposed paintings of his own with ones by the painter Paul Thek (1933–1988). In 1958, when Luc Tuymans was born, Paul Thek was twenty-five years old; when Tuymans was thirty, Thek died. Despite large-scale exhibitions in the major museums of the world, Thek’s oeuvre persists in insurmountable remoteness. It has been considered an example of a “private mythology” (Documenta 7, 1972) and has itself become a legend; Thek is referred to as an “artist’s artist”. Tuymans’s oeuvre, on the other hand, is firmly rooted in contemporary relevance, though only by insisting on its anachronism. It demands to be understood as an “authentic forgery”, radiating an aura of obsoleteness from the outset, and devoting itself to the interminable duration of a disastrous history and a present already bearing traces of its future decay. In the catalogue, Luc Tuymans, the collector Harald Falckenberg, and the curator and author Julian Heynen discuss the relationship between Tuymans and Thek made evident by the show, and the role played by Mike Kelley, who contributed greatly to introducing new perspectives on Thek.